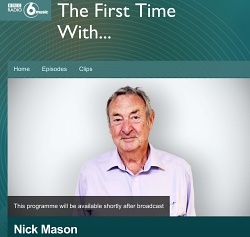 This coming Sunday, July 15th, the BBC Radio 6 Music's 'The First Time with...' Nick Mason airs. One of the founding members of Pink Floyd, Nick shares his musical milestones with Matt Everitt. Nick discusses the early years, and his first impressions of band mates Roger Waters and Syd Barrett. The hour long show is broadcast from 1pm UK time. If you go to the BBC Radio 6 website you can find a landing page that not only includes Nick's upcoming show, but also the ability to hear, on demand, the same show featuring Roger Waters from July 2016, and David Gilmour from September 2015. BBC6 Music can be heard in much of Europe, online at www.BBC.co.uk, and the show itself can be heard via the BBC's iPlayer service following broadcast. Listeners worldwide may also be able to tune in via the TuneIn app for Apple/Android devices. Our thanks to Dave Carlin, Stuart Barstow and Ken Carter for letting us know about this show.